Ang Temba Sherpa called the Berg Adventures office this morning and reported that the trekkers had a great day today. 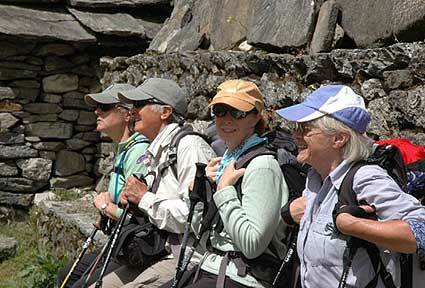 After some breakfast Chuck, Sally, Linda, Catharine, Wendy and Ang Temba left Pheriche for the long walk to Namche. They left at 8:45am and reached Namche at 5:00pm. For such a long walk they made it in great time! They were able to enjoy one more visit to Ang Temba’s ‘Sky Lounge’ in Pangboche when they stopped for lunch. Tomorrow the group will spend the morning in Namche and do some last minute shopping before they make their way to Monjo. Ang Temba reported that everyone is happy and healthy and enjoying the comfort of their rooms at the Panorama Lodge in Namche Bazaar.